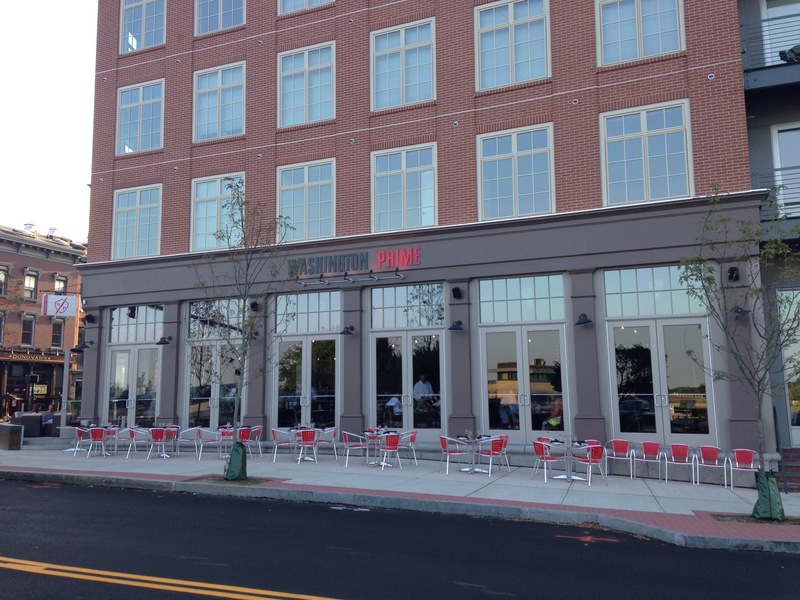 On the corner of Washington Street and Water Street is South Norwalk’s newest formidable addition to the food scene: Washington Prime, Eating + Drinking Well. The large glass windows, clean brick façade with a pop of orange in the outdoor seating and bold lettered sign outside grabs your attention and beckons you to go inside. And go inside, you must! 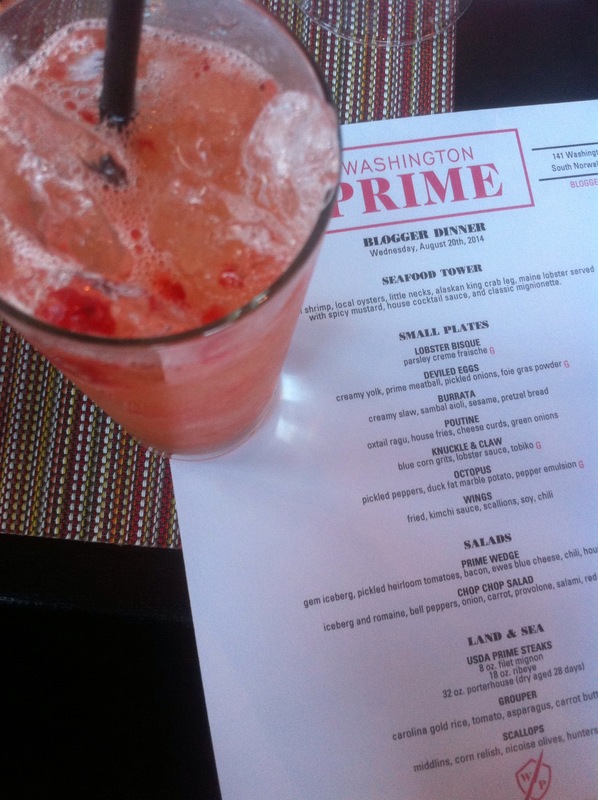 The inside of Washington Prime is pleasantly surprising and not what I was expecting based on its outside appearance. The interior atmosphere is cozy, comfortable, and trendy, and you might even say a little funky with some unexpected features. I don’t know about you, but for me I really notice the atmosphere of a restaurant and my response to it once I am seated. When you sit inside Washington Prime it’s as if you’re sitting under a canopy. The large windows give you a fantastic view outside so you almost feel as if you are indeed outside. 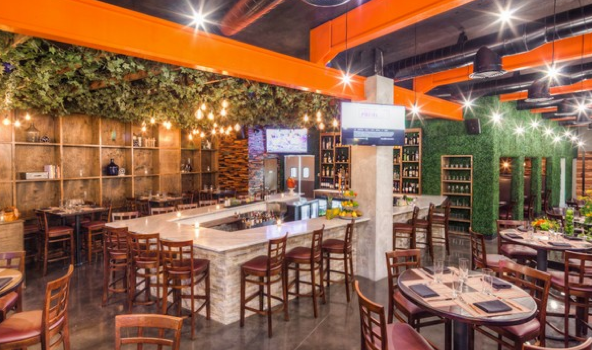 Polished cement flooring and exposed reddish-orange iron beams pay homage to the space’s former occupation as the old Ironwork’s building, and these details are softened by a green ivy (yes, I said green ivy) backsplash behind the marble bar, ivy climbing and woven around the iron beams, and a floor-to-ceiling ivy wall. Reclaimed wood shelving and wood panels along with delicate hanging lights from the canopy of iron, wood, and ivy simultaneously create a cozy and edgy atmosphere. 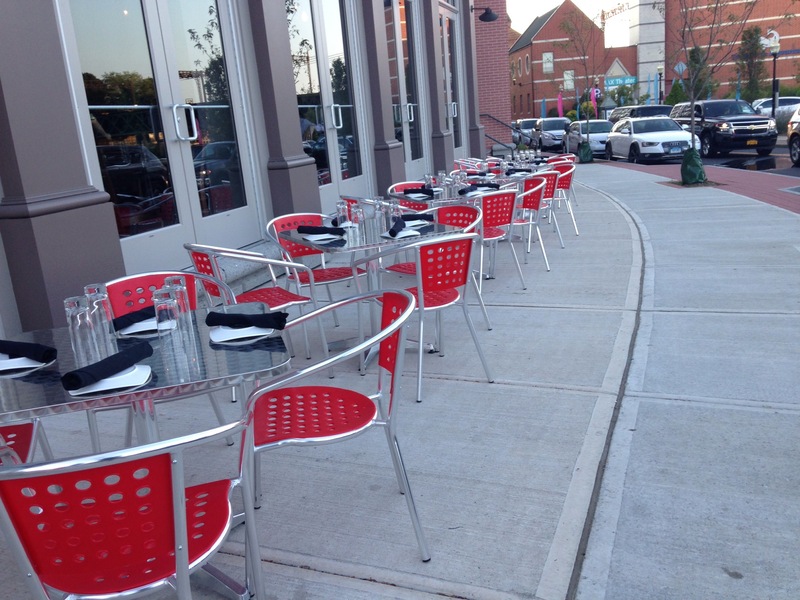 For diners who wish to actually enjoy their meal outside, Washigton Prime has two outdoor seating options: traditional tables and chairs (see photos above) and a lounge style patio area which is perfect for hanging out during happy hour. I began the evening with the “Pippi Longstocking,” which I picked for both its ingredients and its name! The “Pippi Longstocking” is made with Smirnoff vodka, muddled strawberry, vanilla bean, and lime juice. 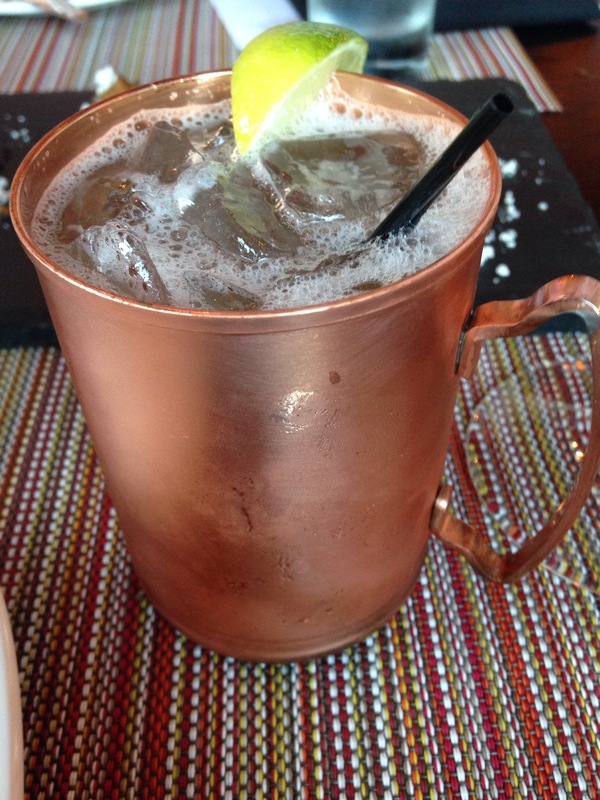 My husband enjoyed the “Moscow Mule” made with Tito’s vodka, ginger puree, lime juice, and ginger beer. 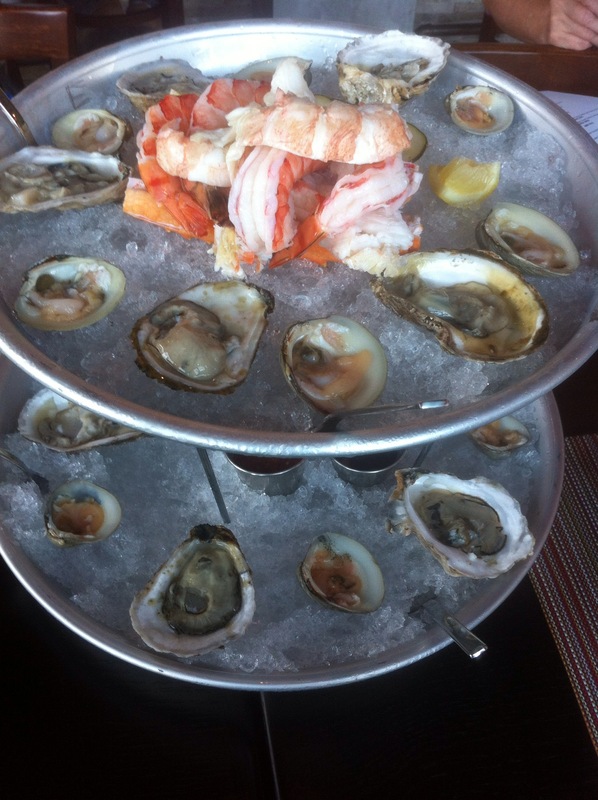 We began our dinner with a Seafood Tower comprised of colossal shrimp, local oysters, little necks, Alaskan king crab legs, Maine lobster served with spicy mustard, house cocktail sauce, and classic mignionette. 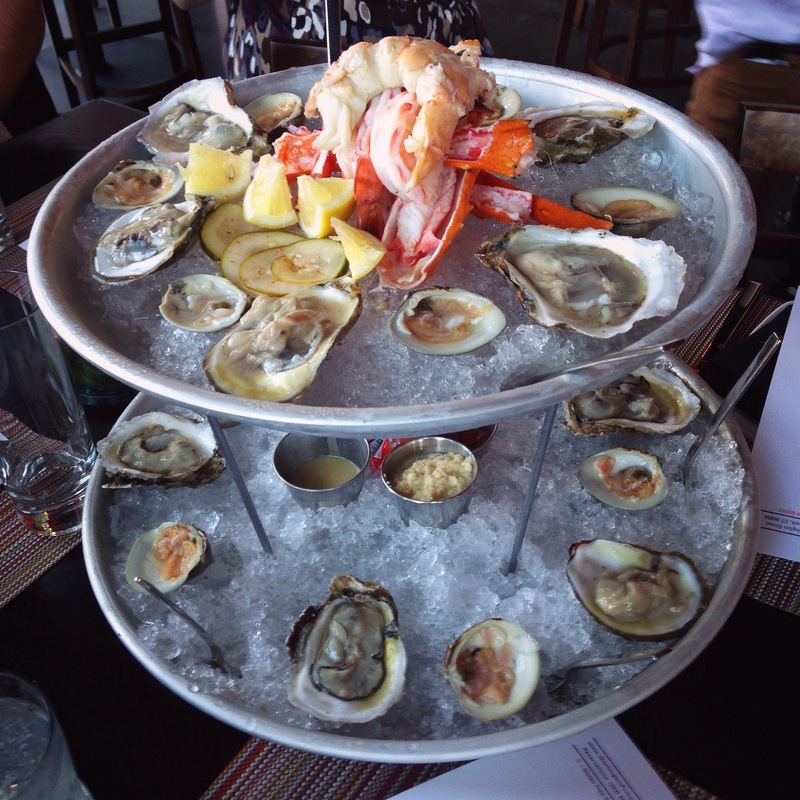 Aside from the wide assortment of seafood to choose from, the Seafood Tower was noted by everyone in our group for its freshness and how the accompanying sauces added some extra flavors to get everyone’s tastebuds going. 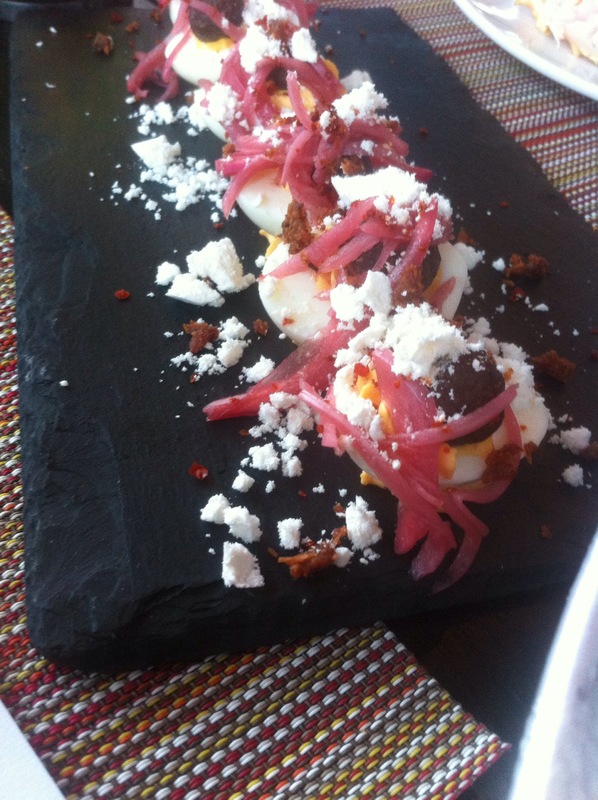 This appetizer was a huge hit with our group and I’d recommend ordering it when you visit Washington Prime. 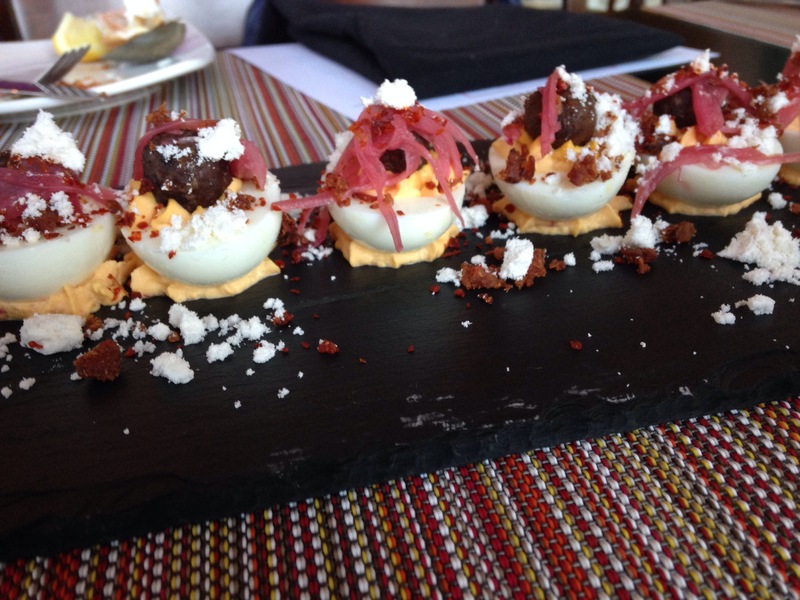 Deviled eggs are an item I noticing more and more on restaurant menus, but I have to point out that what makes the deviled eggs unique at Washington Prime is the addition of the mini meatball and fois gras powder. 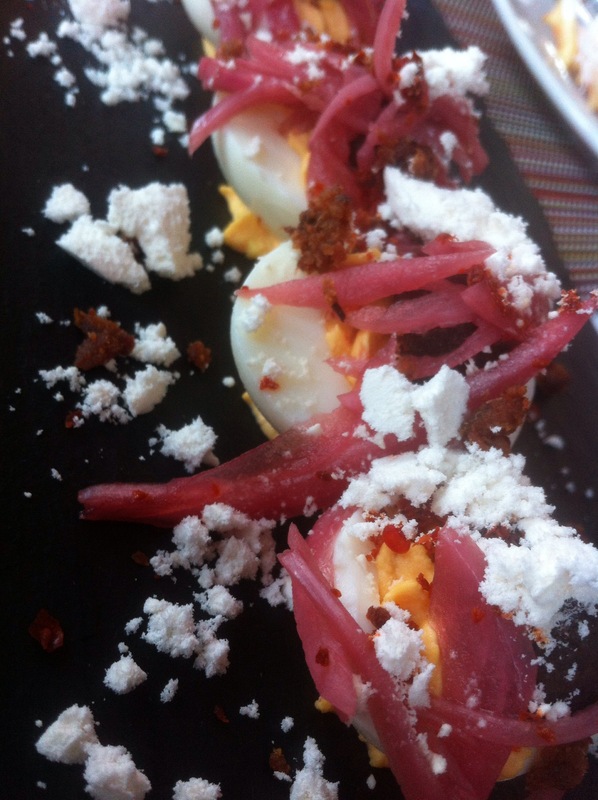 That’s right, these deviled eggs are made with a creamy yolk, a prime mini meatball, pickled onions, and fois gras powder. 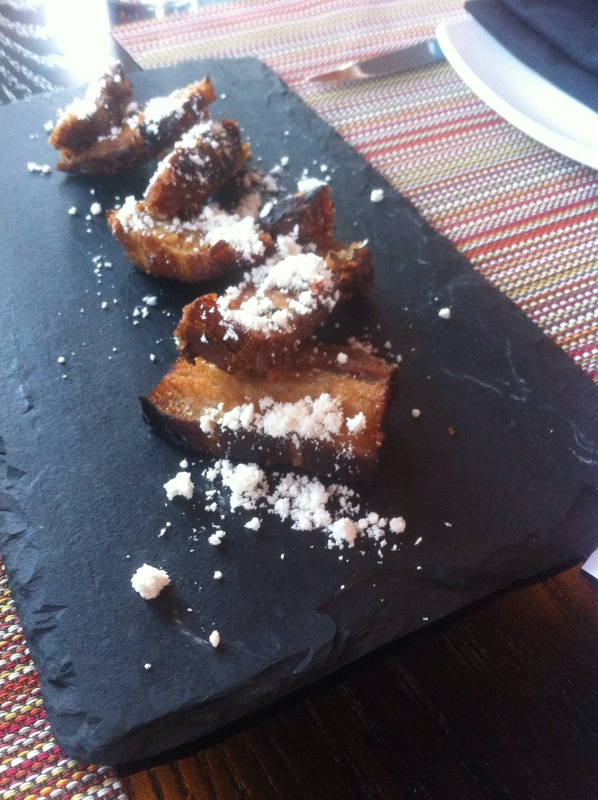 I should also add that this appetizer, like so many we tried at Washington Prime, is gluten free. 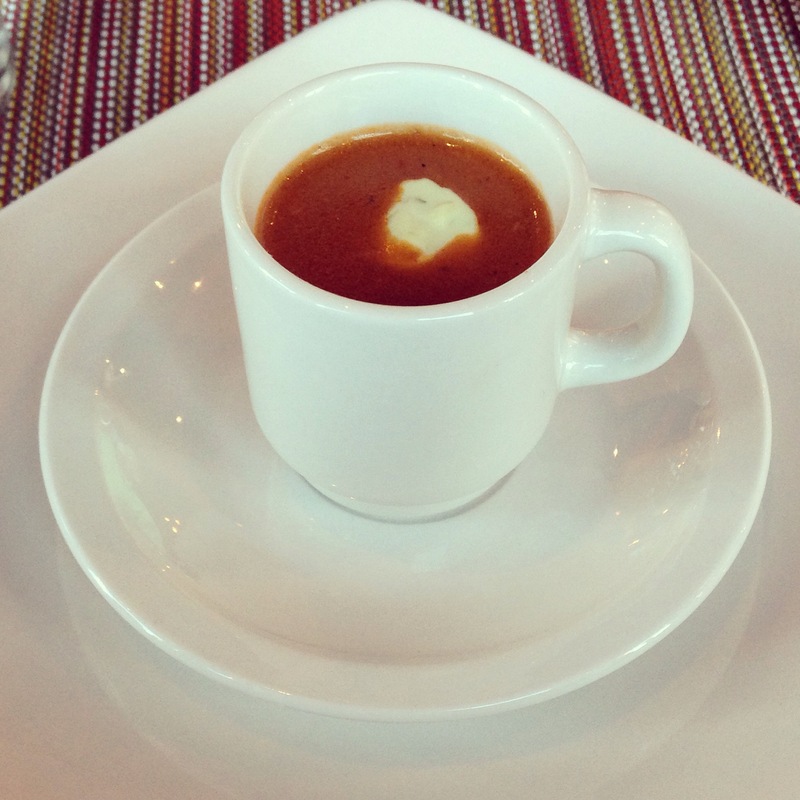 Similar to the Deviled Eggs, this next appetizer is also something you see on so many menus in Connecticut and the surrounding areas – Lobster Bisque. What sets Washington Prime’s Lobster Bisque apart from others I have tried is the freshness of the lobster coming through along with the flavors of parsley crème fraische. Overall the soup is not too heavy, but rather a brilliant balance of flavors and ingredients to create a lobster bisque that is light, flavorful, and memorable. I’m a newcomer to burrata cheese and I have no idea what took me to long! Burrata is an Italian cheese made with mozzarella and cream so it is very soft and creamy. 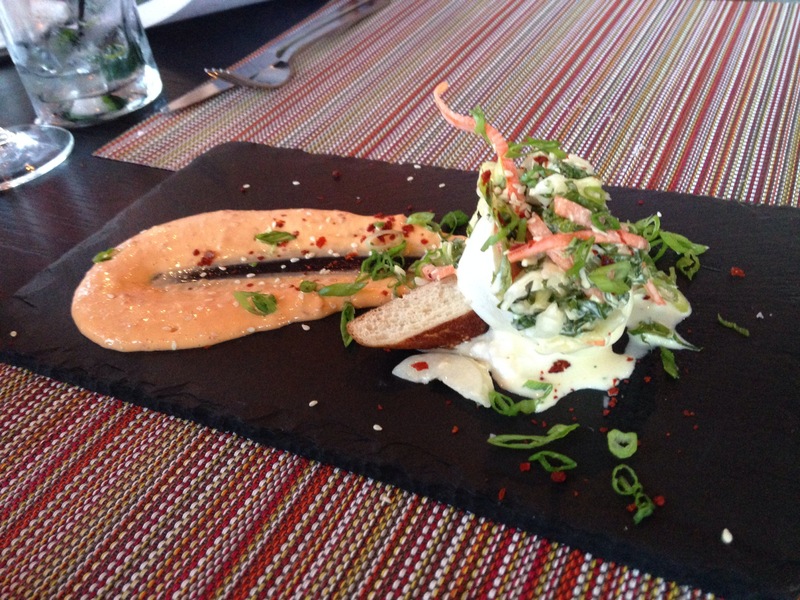 The Burrata appetizer is a combination of burrata cheese, creamy slaw, sambal aioli, and sesame on top of a pretzel bread. The soft burrata spreads on the bread, and the bread helps to soak up the creaminess of the cheese and the creamy slaw – delicious! Executive Chef Jared Falco came out several times to talk about the different dishes and explain their ingredients and the cooking process. 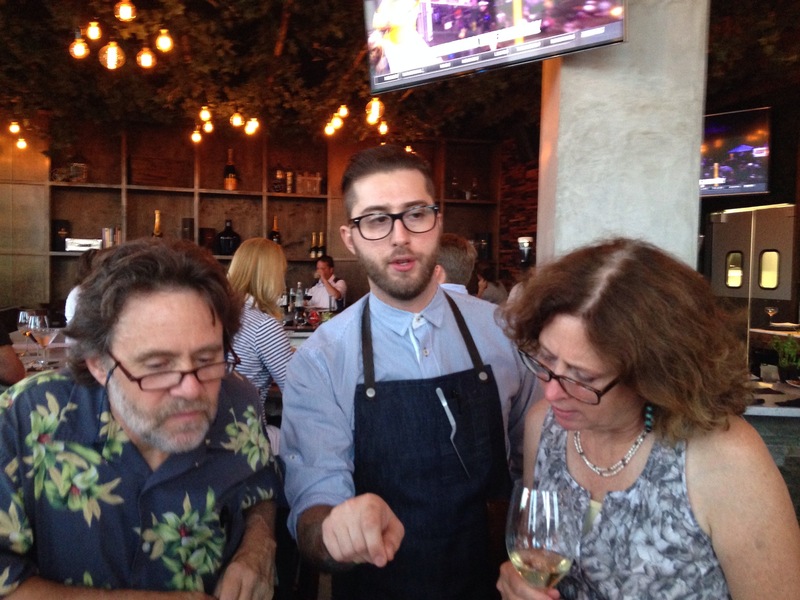 It’s always a great experience hearing chefs talk about their dishes and the cooking process! Here he is describing the fantastic poutine to us. The Poutine was hands-down my FAVORITE dish of the evening. I’ve never experienced poutine before, and wow have I been missing out! 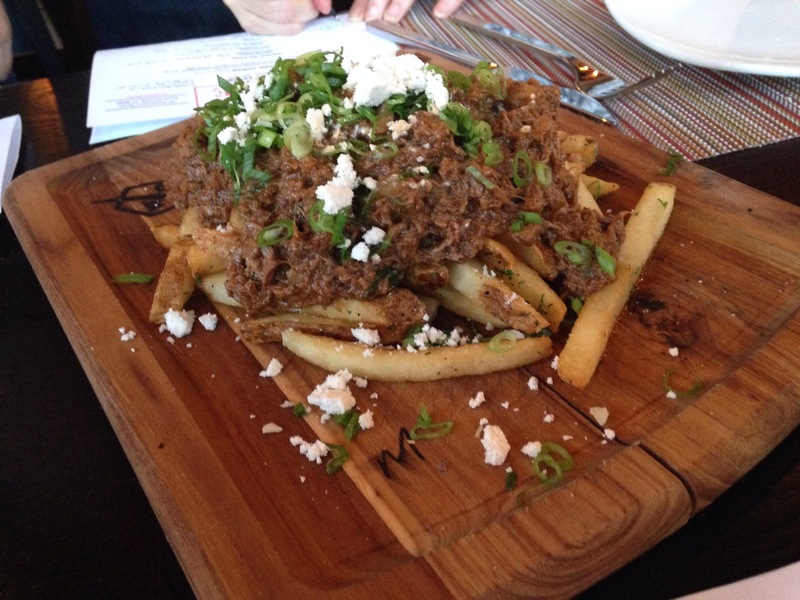 Made with oxtail ragu, house fries, cheese curds, and green onions this dish reminds me of disco fries – the starchiness and saltiness of the housemade fries along with the flavor of excellent ragu and creamy cheese curds -but it’s a hundred time better! This appetizer is large and could be made into a meal all by itself, which I have to admit, I’m looking forward to doing next time I visit. 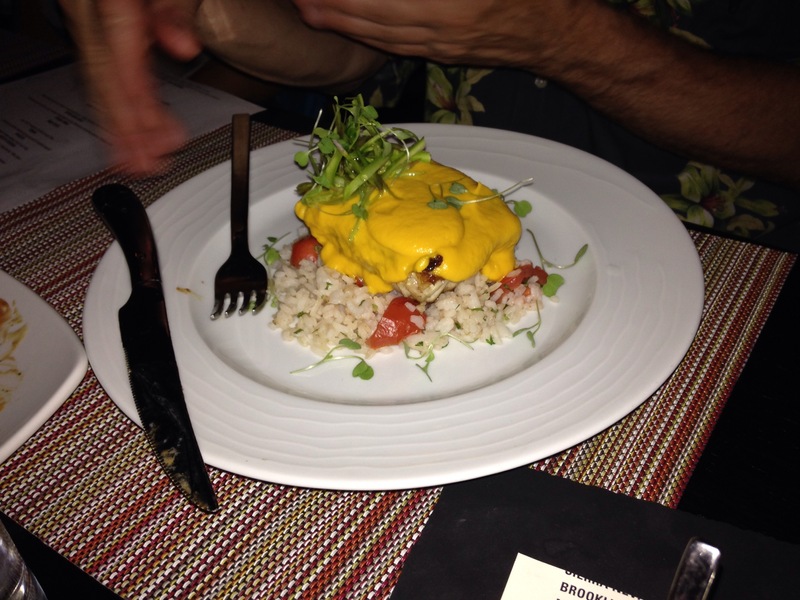 What I liked about the Knuckle & Claw was the uniqueness of the dish. 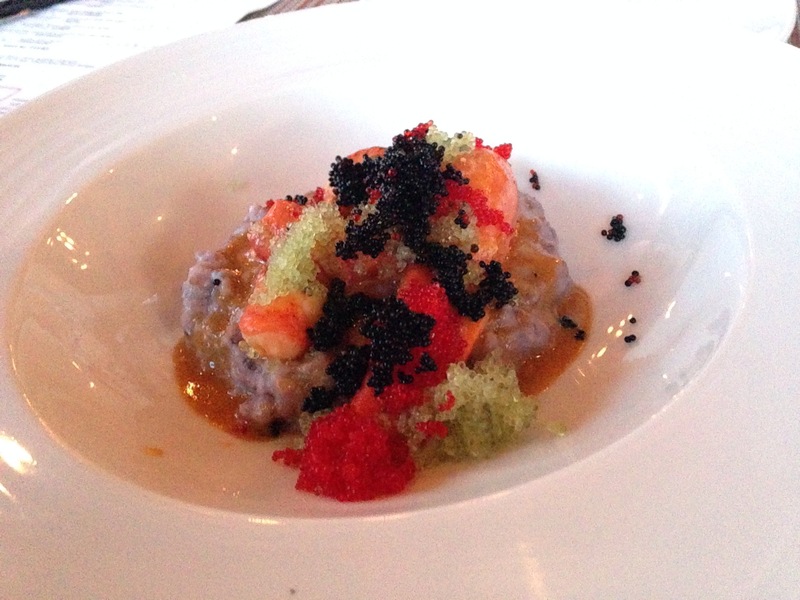 Blue corn grits, lobster sauce, and tobiko really create a medley of flavors and textures that is something you must experience for yourself. Octopus is quickly becoming one of my favorite things to eat and the Octopus at Washington Prime makes my list of favorites. 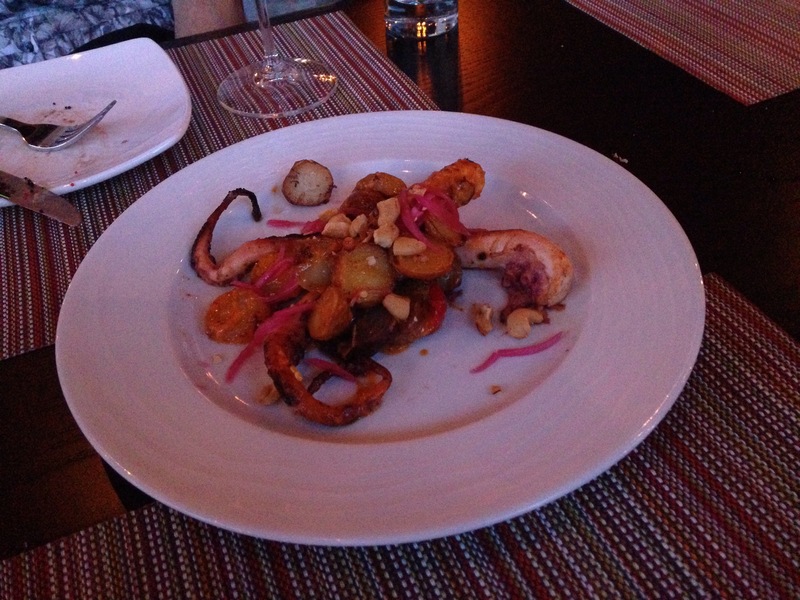 Pickled peppers, duck fat marble potato, and a pepper emulsion comprise this dish along with perfectly cooked octopus. My dear reader, most of you know that I’m very partial, ok let me be honest, I’m biased when it comes to wings and I have my favorite wing place. 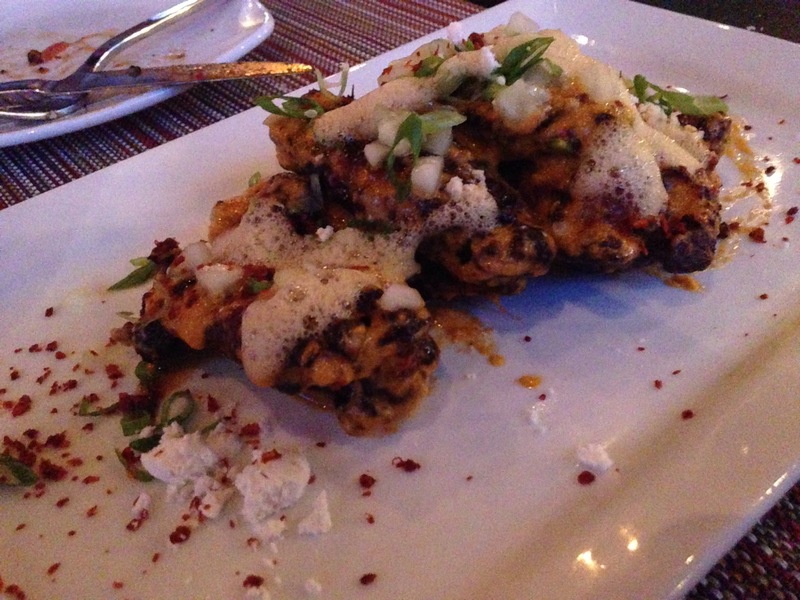 However, the wings at Washington Prime have made my list of favorite wings. Seriously. These fried wings are tossed in a kimchi sauce and served with scallions, soy, and chilli and they are gooooooood. Aside from the flavors of the kimchi sauce and other ingredients together, nothing beats a chicken wing that is cooked just right and would be delicious even without all the extra goodness of sauces and other toppings as these wings are. 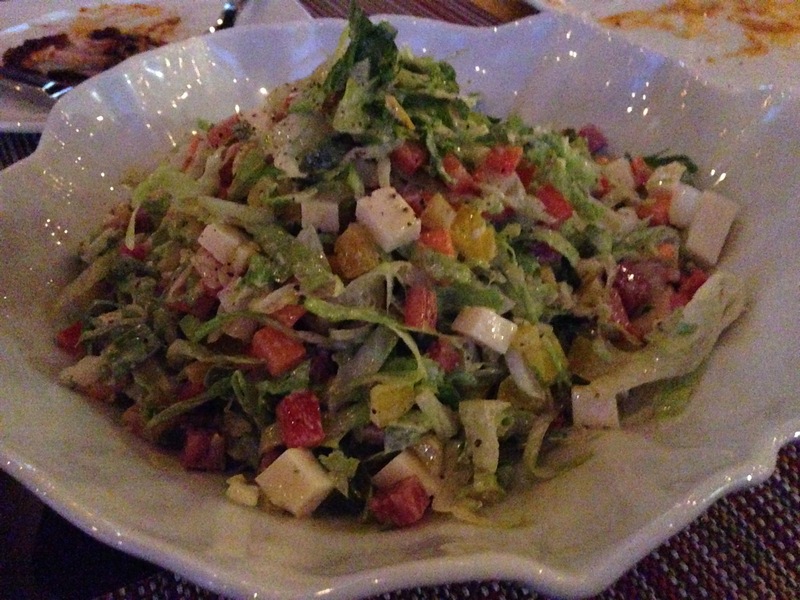 The Chop Chop Salad is light and I really liked all the flavors of the Iceberg & romaine lettuce, bell peppers, onion, carrot, provolone, salami, and red wine vinaigrette. For fans of wedge salads, this one is worth trying! 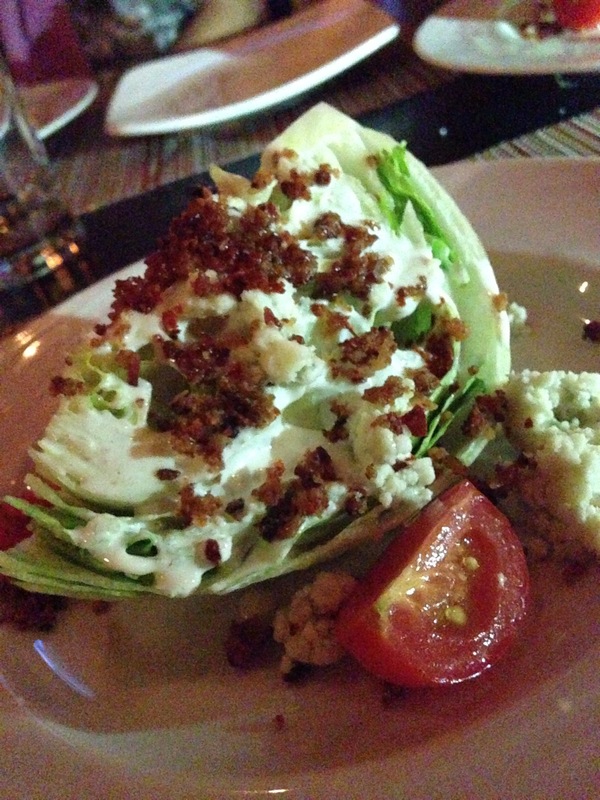 Washington Prime’s Wedge Salad includes gem iceberg lettuce, pickled heirloom tomatoes, bacon, Ewes blue cheese, chili, and house ranch dressing. What makes this wedge salad different, and the part I enjoyed, was both the blue cheese and the ranch dressing together in this one salad making this wedge a little different from what you typically see elsewhere. There were so many entrees to try from that by the end of our meal I was convinced that Washington Prime truly offers something for everyone. The Grouper and the Scallops further demonstrated how Washington Prime’s menu puts their own unique twist on items you might typically see on menus elsewhere. The Grouper (pictured above) is presented over Carolina gold rice along with tomato, asparagus, and a carrot butter sauce, while the Scallops (pictured below) are plated with middlins, corn relish, nicoise olives, and hunters sauce. An added feature that’s sure to please is that both dishes are gluten-free. When one goes to the steakhouse, one must try the steak at the steakhouse, and that is just what we did! For the land portion of our entrees we tried three different steaks: the 8 ounce filet mignon, 18 ounce ribeye, and the 32 ounce porterhouse. 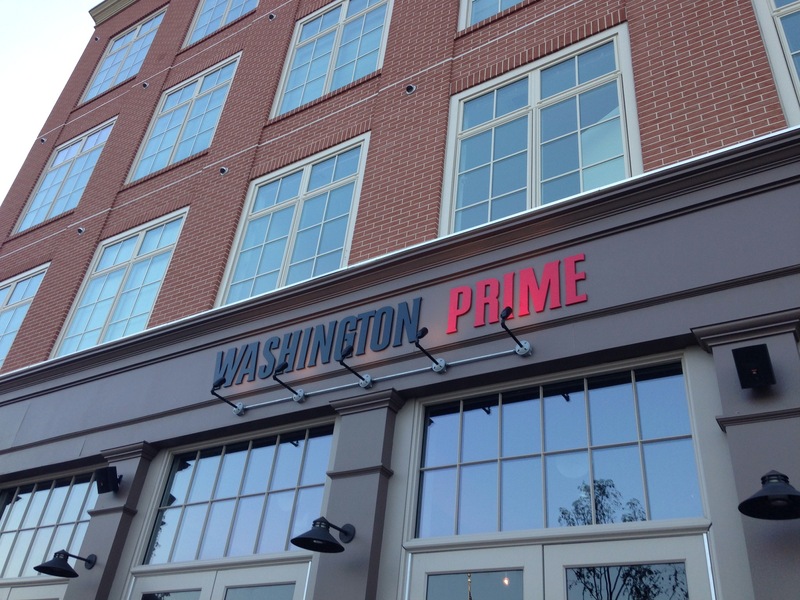 All the steaks at Washington Prime are USDA prime certified and sourced from Pat LaFrieda meats in New York City and originally from Creekstone Farms in Arkansas City, Kansas (for even more info check out Washington Prime’s website). 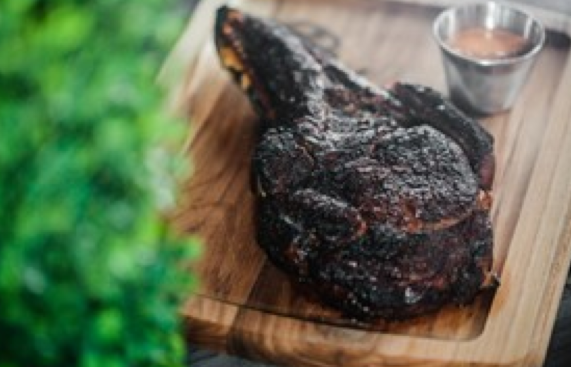 Cooked in a 900 degree special broiler to your preference and served with your choice of one sauce (prime steak sauce, chimichurri, horseradish sauce, umami bomb sauce, bernaise sauce, warm clarified butter, or maple truffle chili sauce). 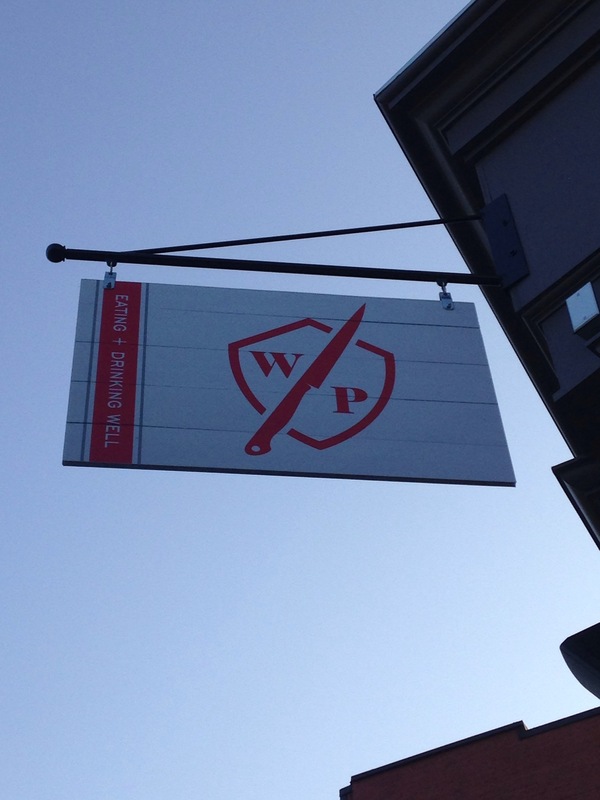 Washington Prime takes their steaks very seriously and it shows when you bite into one. 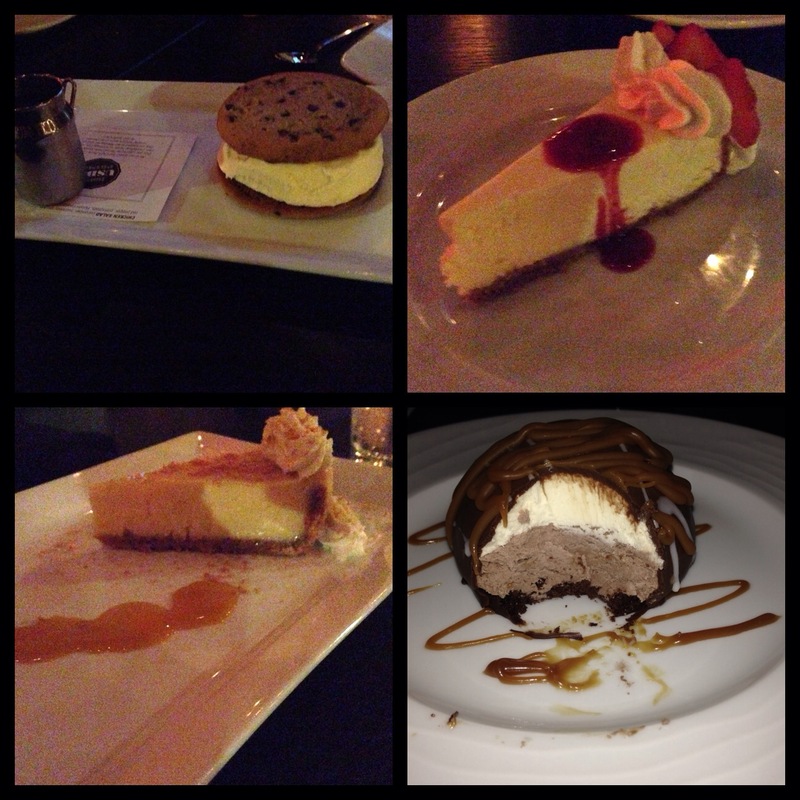 Dessert is the finishing touch to a wonderful meal and Washington Prime gave us not one, but four different ways to finish our memorable meal! The chocolate chip cookie ice cream sandwich is made from scratch at Washington Prime and is served with cereal milk – that sweet, sugary milk similar to what you experience when you get to the end of a bowl of cereal – and it is every bit as good as it sounds. The cheesecake shown here with two different types of sauces on top are classic examples of what cheesecake should taste like. Finally, we tried a chocolate cake with vanilla ice cream combination covered in a chocolate shell and then drizzled with caramel sauce when served. It was hard to choose which was my favorite; these are desserts you want to tell people about, but you won’t want to share them when they come to the table! 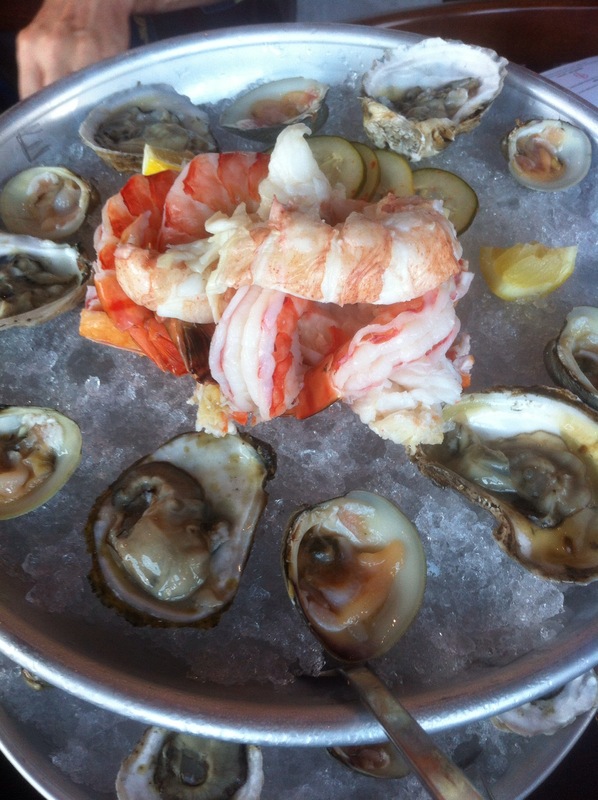 Whether you come for happy hour on the patio or to enjoy lunch or a full dinner, you can expect a dining experience that will beckon your belly to return! *Disclaimer: I was invited to this dinner, however all the views and opinions expressed herein are my own. of the engine and drive train than petroleum oils do and so lend themselves well to use in modern highly fuel efficient hybrid cars.